Greetings friends! This is Shane Colwell. Wow, what a long, hot, but great day! Christina spent the day teaching and encouraging women at a church on the other side of the city. Many of these women are apart of the Micro Seed loan program. Christina said that it was a very rewarding time. Jerry, Neal, and myself spent the day with the pastors once again. The church building was being used today, so we taught under a tent. Jerry began the morning with a challenging devotion for them. Jerry has done a great job this week. I have been so encouraged to see the Lord develop his giftings. After Jerry spoke, Neal and I taught the last part of James. We then ended the day by beginning to teach the pastors how to put together a topical Bible study. We are using the subject of prayer as an example. 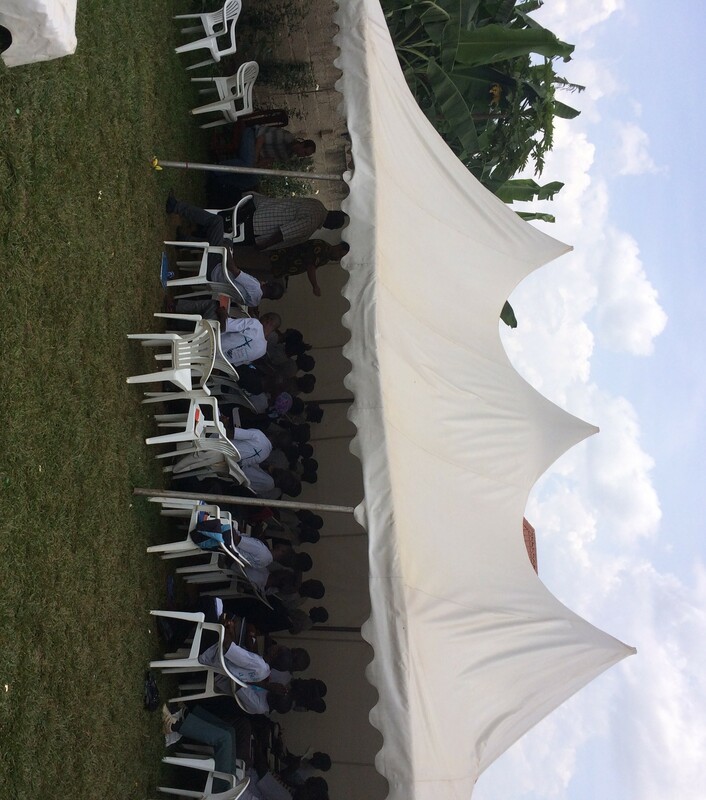 It was a very hot day, but the Pastors remained attentive and lots of INTERESTING questions! Many of these questions centered around James 5, where James instructs the sick to call on the elders to anoint them in oil, and pray for them for healing. There has been a great deal of superstition, and false teaching that has been spread here Rwanda. One of the pastors asked about a special oil that heard of that knocks people over when ever it is applied. Another pastor said that he heard of a pastor who went to “heal” someone and told the people there that God had told him to ground up leaves in his hand so that they would have special healing power when they were applied. Still another told a story of a pastor he had heard of who went to Israel to get baptized, and bought an expensive oil. So he came back and told people it was expensive, and had extra healing power, so only those that made a “qualifying gift” to him could be anointed and healed. Needless to say, Neal and I will be looking for this oil when we return to the states! Lol! The late afternoon brought tragic news for one of the pastors in our group named Simeon. He received a call that his 1 1/2 year old son had died of a recent sickness. As a dad myself, I can’t imagine the depth of the pain that such news would bring. And worse, he is from the outskirts of Rwanda, and had no way of getting home yesterday. Immediately upon hearing the news, I led a prayer time for the family. Please join us in praying for this dear brother and his family. Finally, we spent part of the evening visiting Peggy in the hospital before heading for a very late dinner. I was so encouraged to see her, and was blessed by her strength and demeanor. She had successful surgery, is resting fairly comfortably, and appears to be healing well. She said that she has been overwhelmed with the love, support and prayers of so many. Please pray that she can be released today with a good report, and so that she and John can find a flight in business class soon, so that they can return comfortably, but also asap. We thank you all for your prayers for our trip! This has been a trip with some trial, but God is faithful, and is working here in Rwanda! Continued prayer….thanks for the share! It has been so apparent that God has placed you all there for a reason. Your updates have been very uplifting spiritually back here as well.